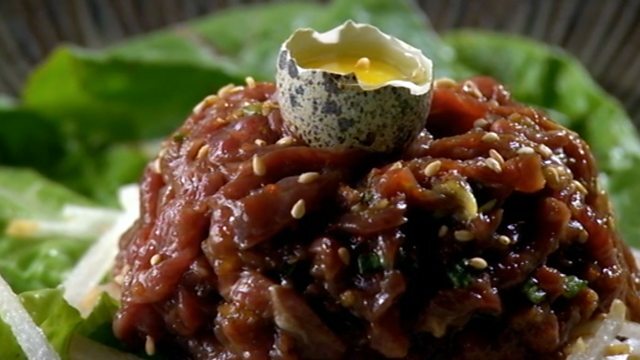 Buy top-notch beef for this spicy Korean-style beef tartare served with sliced pear and the garnish of a raw quails’ egg. Trust us on this one. Trim away any sinew from the beef and thinly slice. Pile a few slices at a time and cut into super thin strips. Place the beef in a large mixing bowl. Finely chop the spring onions and add to the bowl with the soy sauce, sesame oil, chilli powder and sugar and mix together. Add to the beef and mix well with a spoon. Core and slice the pear into strips, remove the leaves from the Little Gem, wash and dry with a little kitchen paper or salad spinner. Divide onto four serving plates with a handful of Asian pear on each and the beef on top. Sprinkle with sesame seeds and top each serving with half a shell of quails’ egg filled with the egg.